Kale is one of the healthiest vegetables on earth. A couple of years ago, most people had never even heard of this leafy green and now those same people are happy to massage it for a fresh kale salad recipe. 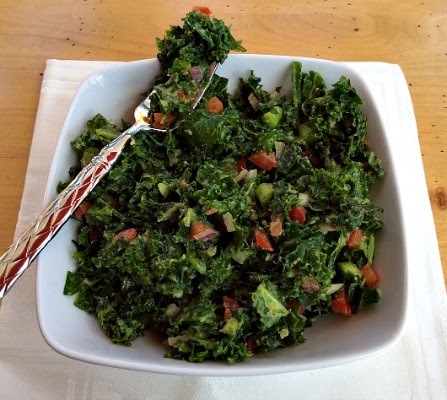 With so many ways to prepare this antioxidant-rich green, preparing a Raw Kale and Avocado Salad recipe is definitely one of the simplest; and one of my most favorite salads. De-stem the kale and chop crosswise into small pieces. Place into a mixing bowl and massage along with the olive oil, lemon juice, avocado and salt, working well with your hands until the leaves are well coated in the mixture (this is a crucial step to create a "cooked" effect). Add in the onion, tomato and cayenne, blending well to combine. Just made this for lunch - was delicious! Thanks for the great recipe. So happy you enjoyed it! Thanks again for visiting my blog!